Bharatiya Janata Party leaders said it was necessitated to avoid revolt within the party. The ruling Bharatiya Janata Party (BJP) has awarded tickets to close family members of several party leaders to contest the December 7 assembly election in Rajasthan, deviating from its stand against dynastic politics. Party leaders said it was necessitated to avoid revolt within the party. In the BJP's first list of 131 candidates released on Sunday night, the party has given ticket to its 85 sitting MLAs. The first list comprises sons, grandsons and daughter-in-laws of several prominent leaders of the BJP. The BJP has given a ticket to Ram Swaroop Lamba, the son of late MP Sanwar Lal Jat, to contest election from Nasirabad seat and to Shailesh Singh, the son of late former state minister Digamber Singh, from Deeg-Kumher seat. From Kolayat Assembly seat in Bikaner district, the party has given ticket to senior leader Devi Singh Bhati's daughter-in-law Poonam Kanwar. It has fielded Rishi Bansal's wife Ritu from Bayana seat in Bharatpur district. The other names include former minister Nandlal Meena's son Hemant Meena from Pratapgarh, former legislator Gurjant Singh's grandson Gurveer Singh Brar, former legislator Kailash Bhansali's nephew Atul Bhansali from Jodhpur and former legislator Kunjilal's son Rajendra Meena from Bamanwas. The leaders said the step was also taken to avert results similar to the 2008 assembly election when the BJP lost power due to loss of more than 15 seats. 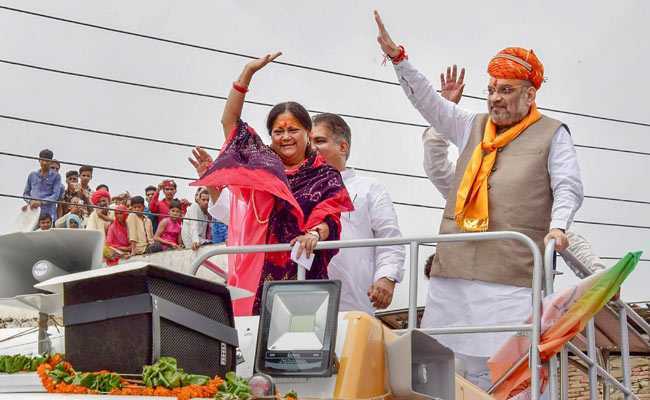 If the party had not suffered a jolt due to revolt against then Chief Minister Vasundhara Raje, the BJP could have formed the government taking along Independent candidates, they said. The Congress won 96 seats in the 2008 assembly election while the BSP won six seats and Independents bagged 14 seats.